The Android-based Dell Streak 7 is the ultimate entertainment hub for those craving a rich multimedia and web experience. 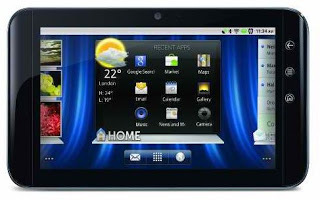 It features a brilliant 7-inch WVGA multi-touch display made of damage-resistant Gorilla Glass that’s ideal for Web browsing, streaming video, watching TV and movies, reading books and magazines, or playing games wherever you roam. Powered by a screaming fast, dual-core 1 GHz NVIDIA Tegra 2 processor, the Streak 7 is loaded full of entertainment and family-friendly apps–from Kindle for Android and Zinio magazines to BrainPOP and Slacker Radio. The Streak 7 also helps you capture and shares favorite moments with the rear-facing 5 megapixel camera for high-definition stills and video recording and a front-facing 1.3 megapixel camera for video-calling using the preloaded Qik Video Chat application. Other features include a 16 GB internal memory that can be expanded via optional microSD memory cards (up to 32 GB in size), Swype virtual keyboard technology, full support for Adobe Flash Player, up to 4 hours of continuous video playback time, and up to 3 days of standby time.